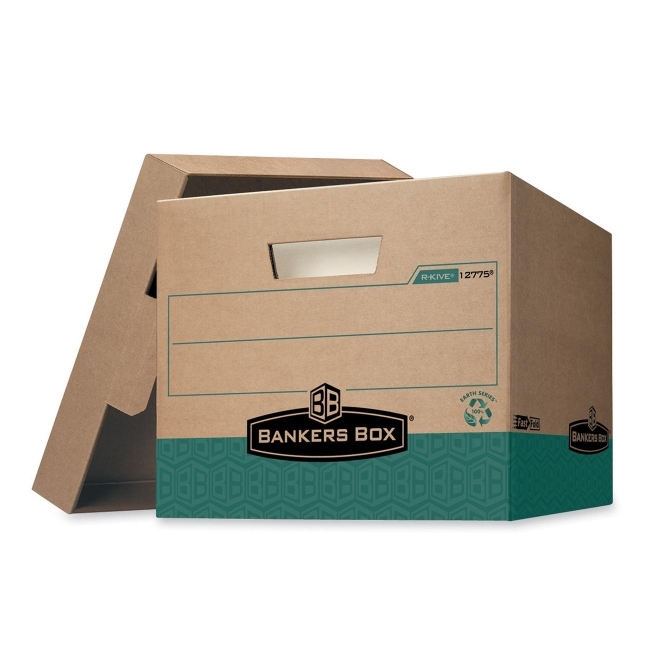 Heavy-duty, environmentally friendly box with secure locking lid is ideal for stacking without shelving and archiving inactive files. Multilayered construction offers 70 percent more stacking strength than basic letter/legal size boxes. FastFold One Step Setup makes box assembly fast and easy. Locking liftoff lid stays in place for secure file storage. Reinforced hand holes resist tearing and make the box comfortable to carry. Storage box is built for heavy daily usage and maximum stackability. Average amount of evenly distributed weight that can be safely stacked on top of box is 800 lb. Boxes are made of 100 percent recycled material with a minimum of 100 percent post-consumer content.